Why did your last diet fail? Did it simply not work? Did you merely not try hard enough? Well I have a little good news for you. Despite the consequences of why it failed, I have a couple of tips that will make losing weight a much easier task for you. Well firstly, I want to encourage you to drink a lot more water! The more water you drink, the more weight you lose. That's the common equation for water consumption. Try to get about a gallon/3.8ltr down every and each time. You'll start losing weight very quickly.Its not easy but you'll start feeling better very quickly. Then, try splitting up your meals. Cut back your 3 meals all in half in order to consume 6 meals with a overall total of the same amount of food that was inside that 3 meals for the day. Your metabolism will really start to kick in and slash weight. This will make your diets feel a lot less like a diet. It's of great consequence to remember that starving yourself rarely makes you lose weight. Alright, now let's get into some of the added psychological points of the diet. Firstly it's crucial that you give yourself an incentive to lose weight. That is a good reason. Equally well as a excellent reminder. Something that constantly reminds you what you're dieting for. This will make certain you don't cheat and keep you motivated. Decisively, try focusing on adding up foods to your diet rather than taking things out. Everything healthy that you're ingest is technically better than anything unhealthy that you'd be otherwise eating. So that's my rant! Half of dieting is taking action! So be sure you're one of the people that in reality does what you're determined to do! Last edited by Butterfly_Dawn on Mon Mar 07, 2011 8:01 am, edited 1 time in total. I've lost my weight so far by eating more food. yep thats right. 6 times a day I eat, and keep that fat furnace burning hot... i.e my metabolism. I drink plenty of water, but also green tea. I exercise, I have a goal, and I dont treat it as a diet. I also eat birthday cake, and bbq's and chocolate. I'm sure you've heard of the lady that died drinking too much water on a radio show she wanted to win something, and she got death instead. I did know the ratio of drinking water per bodyweight in kilos, I forgot, can someone enlighten. There is actually no hard and fast rule about how much water you should drink. If you think about it logically, it doesn't make sense that someone in a 40 degree location should drink the same as someone in a 10 degree location. Then there's variability with exercise, diet etc. 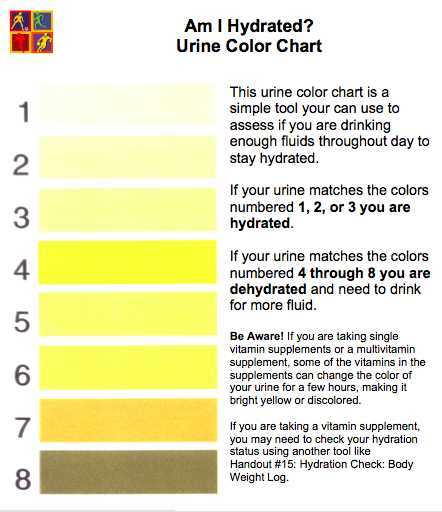 Oh, and if you take anything with vitamin B in it, like Berocca for example, it will go lovely fluro yellow. Wooo! Weight loss is achieved by following a strict dietary pattern with regular physical activity. Timely eating is essential and fasting or skipping meals is not recommended. Drinking water does not only replace the minerals lost in your body from sweating and urinating, water also triggers a fat burning metabolism process happening in the kidney. So drink at least eight 8-ounced glasses of water every day. Engage yourself in rigorous activities which you enjoy. Dancing and playing running sports are some of the best ways to exercise while having fun. Lifestyle modification is also helpful in losing the extra pounds. Drink more and more water. Last edited by CronicBadger on Thu May 05, 2011 1:49 pm, edited 1 time in total. Reason: Removed spam sig. Please do not use forum messages to advertise commercial products. If you have little i suggest you to do some free hand exercise or jugging at morning. * Drink plenty of water. At least 3-4 Liter per day. * Eat green vegetables and try to avoid potatoes. * Eat salad every day and eat CUCUMBER every day if possible. *** Your can try this at morning in empty stomach. 1 Glass Hot water, 1 tea spoon honey, 1/2 lemon juice mix and drink. Weight Loss takes hard work and there are no shortcuts. You have to be consistent, sacrifice and dedication to work as well! 2. Go crazy on vegetables. 3. Control that sweet tooth. 4. Fix times to have meals and stick to it. 5. Eat only when you are hungry. 6. Quit snacking in between meals. 7. Go easy on tea and coffee. Last edited by CronicBadger on Sun May 29, 2011 11:40 pm, edited 1 time in total. I also eat 6 meals per day with my Healthy diet program I am using, and drink a lot of water. It is working great for me have lost about 30 pounds so far. Last edited by CronicBadger on Mon May 30, 2011 9:21 pm, edited 1 time in total. Nice Article! It is really a good blog. I am completely convinced with his thoughts. I will stay in touch for more information. Many people don’t have time for worm up so the yoga is the best therapy of this type people. The most important benefit of yoga is physical and mental therapy. Thanks for sharing with us.